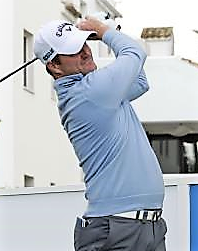 David Borda carded a nine-under-par 62 on the second day of European Tour Qualifying School Final Stage to grasp the 36-hole lead at Lumine Golf Club, Spain with a total of 16 under par 127. The Spaniard leads by four shots from overnight co-leader Daniel Gavins and Anton Karlsson, whose seven under par 64 included a stunning run of six consecutive birdies as he made the turn in 29. Taking to the Lakes Course after making his way around the Hills Course on Day One, Borda made three birdies and an eagle in his first nine holes, before four further gains on the way into the clubhouse ensured he became the man to catch. With 72 holes left to play of the gruelling six-day marathon, Borda is focussed on continuing to play the way he has over the opening two days. “I feel pretty good,” he said. “It’s the best round of my life at nine under and I think I played the best golf of my life too because I didn’t miss many putts. I played pretty much perfectly. I’m very happy. With clear skies and little wind, the conditions have been near-on perfect for scoring but the 32 year old Borda, who has played at Lumine numerous times before, is all too aware the weather could soon change. “I’ve played here many times and I know the courses,” he said. The quartet of Jamie Abbott, Christian Braeunig, Niklas Lemke – who all posted rounds of seven under par on Day Two – and Zander Lombard share fourth place on 11 under par, with six players a further shot back on ten under. The third round will begin on Monday at 9.00am with the top half of the field playing the Hills Course and the bottom half taking to the Lakes Course once again. Duncan Stewart from Grantown on Spey is joint 100th on 141 after scores of 72 and 69. Chris Robb from Banchory, playing out of Meldrum House Hotel, is T112 after scores of 74 and 68. The leading 25 and ties after six rounds will gain European Tour 2019 status. 131 D Gavins (Eng) 62 69, A Karlsson (Swe) 67 64.